Enjoy the new WePlayCiv theme! No problems running thus far, a little loading time, not sure if its normal, nothing too excessive though. I've had no issues on a surface pro i7. I have a pretty modern PC, that I built less than a year ago. But my GPU is ancient.Specs:i5 6600 @ 3.3 GHz6 GB DDR3 RAMRadeon HD6870 with 1 GB RAMWindows 10 64-bit256 GB SSDSo everything's pretty new except the GPU, which is 5-6 years old tech now I think. Still, game runs great, even on mid-high settings. Between turn times in the early late game, which is where I timed last time, was 6 seconds! Been busy at work and of course 6 grandchildren keep me blessed! I was soooo disappointed in CIV V (more than I was disappointed at Sid Meier's Railroad) that I never got the expansion packs and felt used as a long time fan, however it was business and I kept playing and modding - by - Gramps on BTS.....making maps and setups having a blast!!!! I started monitoring and told wife I was going to give it one more shot and am sure glad I did! I couldnt get a strategy guide so I downloaded the PDF at 2K and made my own gameguide...then can add to it when I find some interesting tricks and tips as people post them. Have you heard when the addons such as Map Maker and Modbuddy (thinks thats the name I heard was what they called it????) which are supposed to appear on Steam IIRC?? Take care buddy, Im around more now, played about 7 hours today on CIV VI in between watching NFL all day. I have a pretty modern PC, that I built less than a year ago. But my GPU is ancient. So everything's pretty new except the GPU, which is 5-6 years old tech now I think. Still, game runs great, even on mid-high settings. Between turn times in the early late game, which is where I timed last time, was 6 seconds! Good to hear from you too! Saw your name in the credits, congrats!!!! Thanks Gramps, good to see you too! Hello again, friends. If you remember me you know I knew nothing of computers; now I know still less. A "Steam" thing.. what's that? And several options...since the game began now I guess it's about some kind of connection or that Steam thing. Please, can you be kind enough to help me? Steam is the platform Civ6 uses for distribution. It's a program that lets you buy games (or redeem keys for games bought elsewhere that uses Steam as a platform), and run them. It autopatches the games and makes it possible to subscribe to mods that is also autoupdated. There 4 options: buy the game, buy the game - Digital Deluxe, buy the Steam Controller+the game and buy the Steam Controller+the game Digital Deluxe. So, the "Digital Controller" means better graphics or what? 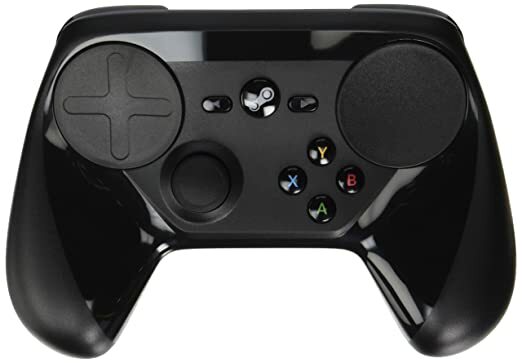 And the "Steam Controller" what for this thing? Digital Deluxe is (IIRC) the item the name for purchasing both the base game and pre-purchasing the next 4 DLC packs up front. This was what I purchased since I would have probably ended up buying them anyway. Steam Controller means you purchase the game with a Steam controller. It's basically like a Playstation controller only with thumb pads instead of thumbsticks. It's very much not necessary for the game (I found the thumb pads difficult to use with other games like Skyrim too). Fed, if you think you'll play the game to death, and I think most here would fall into that camp on first impressions after 4 days of playing, then I'd recommend the Digital Deluxe version. If you're not sure that you'll like Civ6 and prefer to play it safe, or are happy to wait until the DLC are reduced in a sale then go for the basic game. I wouldn't go for the Steam Controller options. Civ plays perfectly well with the old mouse and keyboard. Fed, I looked on Steam and it says you are a member and one of my friends there, so you must have it on your computer already; the last time you logged on was 1070 days ago though. You've played 179 hours of Civ5 on Steam and a bit of Magic: The Gathering. Thank you Roth and Rob. Then I'll buy the Digital but not the Controller. Is there any advantage to wait for the DVD (not on sale yet here in Lisbon) or better go right now to the Steam instalation? And the manual, how to get it? No, not if you don't need the physical extras. No advantage of having the physical DVD in my opinion. There's a manual available via Steam, once you've bought the game, or google 'civilization 6 manual' and follow the first link. Hi, so, at last I got to install the game. Now, I need to print the manual to read it while the game runs. Is it better, if possible, to print from the game or from this site? I wouldn't print it. Just play with it open, and alt-tab as necessary.